Search ration details by name online and other information related to ration card. In order to find the list on your state NFS website, either you have to search through name or ration card number. All the Citizens in India are categorised as people Above Poverty Line (APL), Below Poverty Line (BPL) and Antyodaya Anna Yojana (AAY) families. All citizens under any category can apply for a Ration Card. At present, it is used as an Address Proof by most of the Citizens in India. In this article, we show you How to Search Ration Card Details by Name. It is explained and meant to guide as per instructions listed on the Official website. The procedure is very easier to process with and also can give you full details about your Ration card apart from your Ration Card number. As a reference, we are going to discuss this procedure for the Tamil Nadu (TN) Government. The procedure is almost identical for each and every government as the difference from state to state may vary. In some states, you can check out through Search Ration Card Details By Name or by Number. The following points are the step – to -step guide to Search Ration Card Details by your Name. Visit the respective State’s Public Distribution System (PDS) Website. Click here https://www.tnpds.gov.in/ to visit TN’s PDS website. On the homepage, click on the “Citizen Login” on the left side. You will be redirected to a page with Login Section. Enter all the Login Credentials like Mobile Number and Captcha in their specific columns. Click on the “Submit” button and you will be logged in once your details are verified. Once you are logged you can be able to access the services mentioned in the above image. After logging in, click on the “View your Ration Card details“. Enter the Minimum required details in their columns. Then the Details will be displayed on the following page. You can all the details of your Ration Card such as Name, Residence Address, Family Members list, Category and all others will be shown one after another. This is one of the many procedures involved in the procedure to Search Ration Card details by your name. So many Public Distribution System websites follow the Same criteria but some of the State PDS’s got another procedure to Search Ration Card Details by your Name. One of another Procedure is explained in below by taking Andhra Pradesh State as a reference. For the citizens in Andhra Pradesh, the procedure to Search Ration Card Details by Name is a little bit different when compared to the above procedure. Just follow the below points one after another to Search Ration Card details. Visit the Public Distribution System online portal of AP Government. Click here https://epdsap.ap.gov.in/ to directly visit the page. On the homepage go to “Online Services” section. Click on the “Search your Ration card” in the list. You will be redirected to a page you can know your Ration Card details just with the help of your Name. But, before that, you have to Enter the details such as District, Block/Municipality, GP/Ward and Name of the Applicant. Select your District from the Drop-Down list. 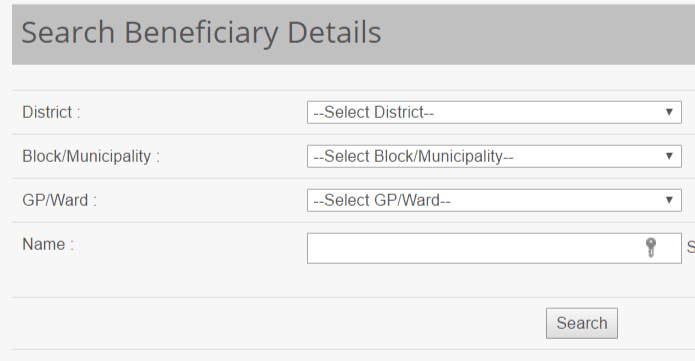 Select your Block/Municipality from the drop-down itself. And move further to Select your GP/ward from the list. At last, you have to enter your Name in its respective Column. As shown in the Image above you will fill all the necessary details in their particular columns. Ensure if they are correct or not. The Name you should write on it should be the same as the details mentioned during applying for Ration Card. After that, click on the “Search” button below the Details section. All the Entered details will be verified by the Online portal, if any mistake is found then the search will be stopped, otherwise, you will be shown your Ration Card details on the following page. All the other details like the Ration Card number, FPS Code, Residence Details are also shown on the page. If you forgot the exact spelling of your Name, then you can check out your Ration card from the list which will be shown instead of Member Details.